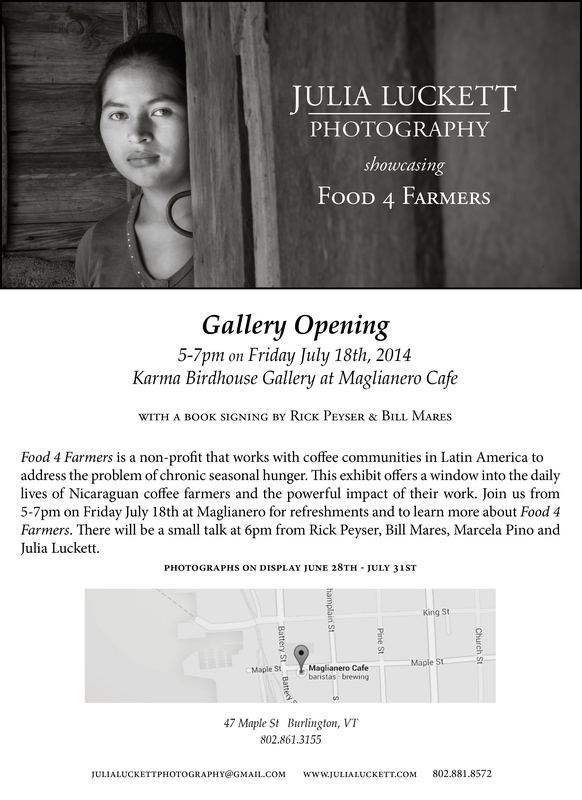 I'm very excited to announce that I'll be showing my Food 4 Farmers photographs June 28th - July 31st at the Karma Birdhouse Gallery at Maglianero Cafe! I'll be displaying 26 images from the series, and if you are in the Burlington, VT area, you are invited to the gallery opening from 5-7pm on Friday, July 18th. I feel very honored that Rick Peyser & Bill Mares will be signing their book, Brewing Change: Behind the Bean at Green Mountain Coffee Roasters, at the event. This is especially significant to me, as this book inspired me to get involved with Food 4 Farmers.